Today, when you order "Sankey-Tized Volume 1", you'll instantly be emailed a Penguin Magic gift certificate. You can spend it on anything you like at Penguin, just like cash. Just complete your order as normal, and within seconds you'll get an email with your gift certificate. Order in the next 1 hour 51 minutes and it will ship TODAY! 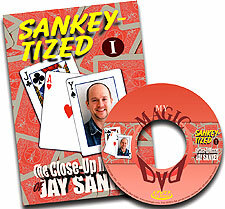 Jay Sankey has created some of the worlds most inventive close-up magic. This DVD features many routines using ordinary objects like cards, coins, keys, rings, spoons and more. He employs simple methods to render his effects entertaining and magical. As an added bonus you get to see Sankey being Sankey as his warped sense of humor, that he developed as a stand-up comedian, shines throughout with some gags and fake routines. Collect Me Not...Again: Three selected cards appear between four queens, the queens vanish and appear under the spectators hand. Also taught is the Revolution Count that displays three cards as seven showing three face up and four face down.